I see some very nice rings, that I'd love to own from this website though. Here's your chance to win Eve's Addiction $60 Gift Code #Giveaway to purchase something you love. Eve's Addiction began as an online jewelry and gifts store. Today, they offer great ways to personalize jewelry and gifts including engraved necklaces, photo jewelry, engraved picture frames and much more. Whether you are looking for the lastest jewelry styles for yourself, or are trying to find the perfect personalized gift Eve’s Addiction has thousands of options to choose from. 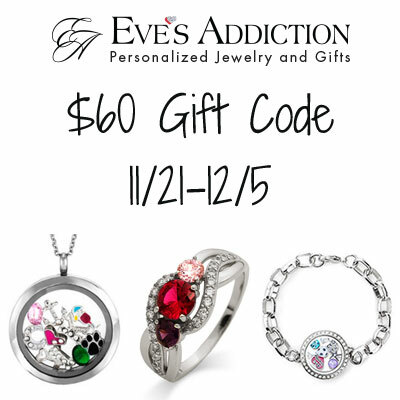 Eve's Addiction specializes in a variety of jewelry and gifts from everyone in your life. From dog tags for men, to family tree necklaces for mom and birthstone jewelry for kids, you will find a perfect option for everyone in your family. I would probably get a necklace because I like them simple and elegant. Dogeared Freshwater Pearls of Friendship Sterling Silver Necklace. I think i would go with the Engravable Sterling Silver Petite Name Bar Necklace with my oldest daughter's name on it & I have to get the Lucky double elephant ring in silver for her as well! She loves elephants.